Be part of our newest initiative, the Free Minds Congressman John Lewis Fellowship, and support a one year paid fellowship for a Free Minds member to promote hope, change, and healing for those most affected by racial injustice. 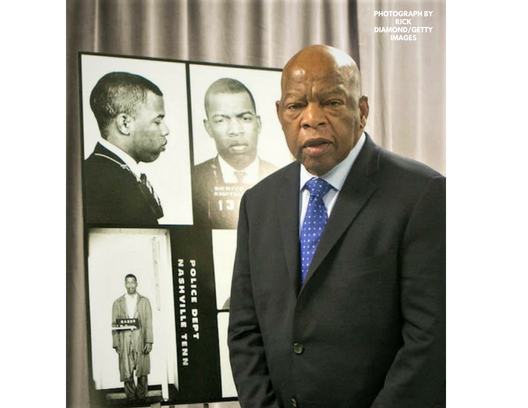 Meet James, the inaugural Congressman John Lewis Fellow. James is a poet, a musician, and a role model to other young people in the Free Minds community and beyond. James spent five years behind bars, and he is now dedicated to giving back. As the Congressman John Lewis Fellow, he works full-time in the Free Minds office, providing crucial support and insight on all aspects of the Free Minds program, and he uses poetry and storytelling to promote healing and nonviolence at local schools and other community spaces. Congressman John Lewis and March co-author Andrew Aydin visited the Free Minds Book Club at the DC Jail to share his remarkable story with the incarcerated youths in the book club. We are proud and honored to carry his legacy forward with the new fellowship. Your contribution will help us make this fellowship a permanent part of our program, and an ongoing opportunity for other Free Minds members returning from prison in 2019. I can't think of a better cause or a better person to honor. We need symbols of hope and ability! Great opportunity for a Fellow to be the change we want to see. He will spread good karma to the community by providing a real-life example of hope. I love Free Minds! They are the real deal!